Hindi Lyrics 4 U: Lyrics Of "Bullet Raja - Title Song" From Saif Ali Khan's Movie - Bullett Raja (2013). 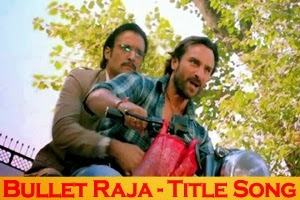 Lyrics Of "Bullet Raja - Title Song" From Saif Ali Khan's Movie - Bullett Raja (2013). The video of this song is available on youtube at the official channel T-Series. This video is of 3 minutes 39 seconds duration. Lyrics of "Bullet Raja - Title Song"
Lyrics in Hindi (Unicode) of "बुलेट राजा (टाइटल सोंग)"